GSF Mortgage is pleased to promote Debbie Beier to COO. GSF Mortgage is pleased to name Debbie Beier as chief operating officer of GSF Mortgage. Previously the general manager, Beier will focus on making each department more efficient and break down the barriers between operations and sales. She will also work on increasing the service level standard at GSF Mortgage. Beier is a well-established mortgage industry professional and has spent more than 20 years in the industry. The majority of her career has been spent in sales. She started out as an account executive in subprime lending and transitioned into an account representative on the conforming lending side. She has spent the past eight years at GSF Mortgage where she began as an account executive for the wholesale division and transitioned into business development and recruiting. Upon being promoted to general manager, Beier easily transitioned to the operations side of the mortgage industry due to her prior operations background in the insurance finance industry. 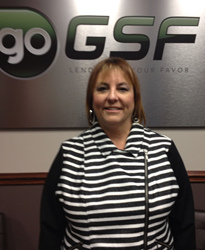 “It is my pleasure to introduce Debbie Beier as GSF Mortgage’s Chief Operating Officer. Debbie’s commitment to our business and industry is unwavering. Beyond the accolades and titles, Debbie does one thing every day better than anyone else: she cares. She cares deeply about our customers and employees. Congratulations Debbie, the promotion is well deserved and we are all fortunate that we work with her on a day-to-day basis,” says President Chad Jampedro. Beier has been named among MPA Magazine’s 2016 Elite Women and was nominated by the Wisconsin Mortgage Bankers Association (WMBA) as a finalist for the Milwaukee Chapter’s Best Mortgage Operations award. Outside of GSF Mortgage, Beier is a Girl Scout Troop leader and also serves on the advisory board at Lenders One. Founded in 1995, GSF Mortgage is an established and experienced direct mortgage lender. With 20 years of lending experience, GSF professionals originate, process, underwrite, and fund all loans. We continue to serve the next generation of homeowners with the GoGSF brand. We are focused on flexible and transparent mortgage lending and are on a quest to continue hiring the "best of the best" in the mortgage industry. With many locations, our strengths keep GSF Mortgage “Lending in Your Favor”. Interested in finding out more about us? Visit us at GoGSF.com and check out our available career opportunities.